Unroll the pizza dough and divide into 4 equal strips. In a frying pan, add the tomato sauce, the mince, the onion and the garlic clove and cook together. 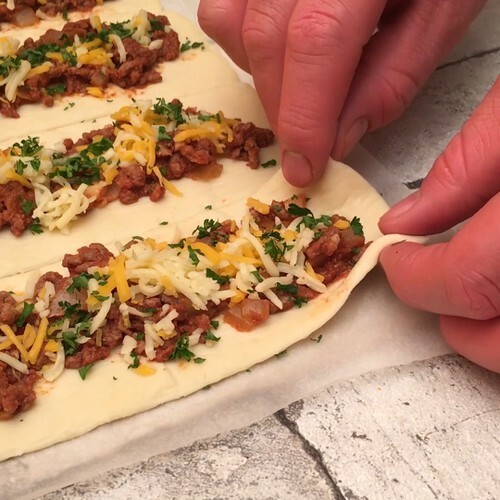 Place some of the mince mix on each strip of pizza dough. Add to the meat the grated mozzarella and cheddar, then add chopped parsley. Close each of the strips to form a baguette shape, then brush with olive oil. Cook a first time at 210°C for 10 minutes, then add more grated cheese to the top of the baguettes. Bake for a second time at 210°C for 5 minutes. Garnish the baguettes with parsley and enjoy.